Gingerbread House Party - A Cr..
Sure, you can use graham crackers for an easy, edible gingerbread house. But where’s the fun in that? I cannot even begin to tell you how much I have been craving the taste of real, honest-to-goodness gingerbread cookies this holiday season. The only passable — actually it was quite delicious, but it was also the only edible one I’ve found — gingerbread I have experienced this holiday season was made by a hotel. For a large catered dinner. For a bunch of foreign computer scientists! And I only got only baby-sized piece. Sigh . . . But now, thanks to my best friend (or rather, her recipe collecting mother) gingerbread time has arrived. Tomorrow night, my house will be filled with deliciousness as I prepare for my holiday party and accompanying gingerbread decorating contest. Be warned: the recipe is a bit slippery. Not physically, but more metaphorically. My friend has made it the same day, with the same measurements and ingredients, and had it turn out quite differently. And the icing is made to harden, which is great for keeping your gingerbread house together, but not great for making in advance. So make a little batch right before you get started, and make more as needed. Cream butter, sugar and dark molasses. Add dry ingredients and water alternately into creamed mixture to form a stiff dough. Roll out dough to ~ ¼ inch thickness and cut shapes. You can roll directly onto cookie sheet. Bake at 350°F for ~8-12 minutes – depends on size of cookies or gingerbread house sections. Note: don’t try to make a double batch – it is a very stiff dough, hard to work in larger volume. approximately 1-½ cups confectioners sugar. Beat egg white in mixer until frothy; add sugar gradually, continuing to beat until glossy white and creamy. Note: Use icing immediately – it hardens with exposure to air. 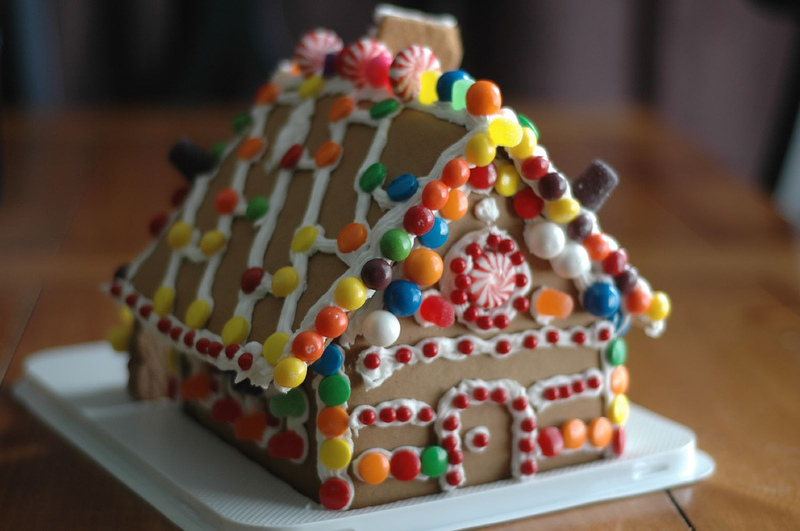 Other kinds of icing can be used for cookies – this icing works to hold a house together as it hardens over time. When I got home last night someone in my building was baking gingerbread. It smelled sooo good. I told Aric I was really disappointed that it wasn’t him making me gingerbread. Perhaps I’ll make my favorite gingerbread cake (it has ground, crystallized, and fresh ginger) when I’m home.